Recently, one of our long-time clients, Blender Boyz, faced the Dragons on an episode of Dragons’ Den, which aired on Jan 25th on CBC Canada. For those in the USA and Australia, this is a similar format to Shark Tank, where entrepreneurs pitch their products or companies to potential investors, and the show gets a big TV audience that tunes in for the great business ideas, shrewd investor negotiations, and pure entertainment value. As business owners, we all dream of a little bit of free publicity to boost the profile of our small business. Often, these boosts come in the form of traditional media – TV, radio or newspaper editorial – and let’s face it, while traditional media’s power continues to erode, exposure through the right medium can still help you reach a large section of the general population. But these opportunities come and go so quickly! As web marketers, we feel there are great digital marketing opportunities that come out of these little “spikes” in media attention. Beyond getting the initial attention, being able to carry that attention into extended publicity or potential customers/partners/employees/investors is a great opportunity. We’ve put together a few digital marketing ideas based on our experience in preparing Blender Boyz for their publicity hit. In preparation for Dragons’ Den, we performed a variety of technical tests and upgrades to ensure the Blender Boyz site could withstand a barrage of traffic when the show aired. This section gets a bit technical, so if you’re just reading for some marketing thoughts, feel free to skip ahead. However, with a potential spike of over 500,000 people during a 10-minute pitch, your first order of business should be to make sure your site doesn’t go down! The very first thing we did was speak to our server vendor to give them time to decide if they needed to allocate any extra resources on the night of the airing. We wanted to feel confident that in any crisis, we’d have the proper support channels and that these support channels would be aware of the situation ahead of time. Because the site uses WooCommerce, it was safe to assume that we might find bottlenecks in our database that could slow the site down, or worse, crash our database server. As a precaution, we migrated the database to Google Cloud’s SQL and added redundancy to it. This caused the site to load slightly slower as a result of the external database connection, but reliability was the key factor in this decision, and we knew we could speed up the site in other ways. Always up ability, so even if the site crashed, customers would be able to view the website. We knew the airing date for the show in advance, so we had time to get this ready. 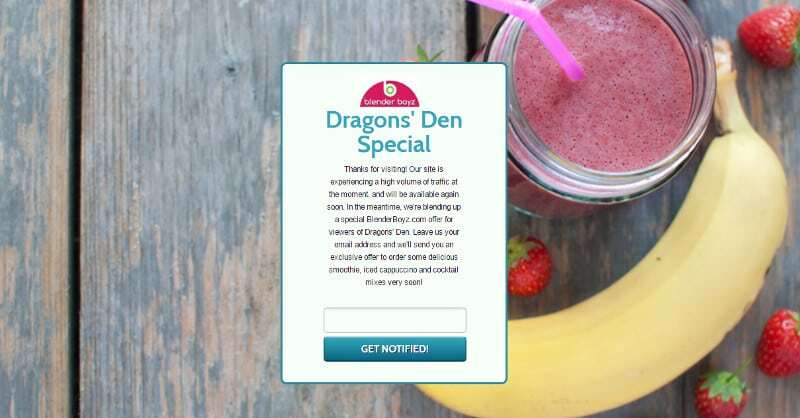 We placed an “as seen on Dragons’ Den” badge on the homepage, and a link to a special offer for people who had seen Blender Boyz on TV that night. Why not try to capture a little business right away? We created a fall-back page, just in case all the server hardening wasn’t enough for the quantity of visitors. This is a great way to turn a setback into an opportunity – we added a simple branded message and asked people to sign up to receive an exclusive special offer in the days following. We have also seen businesses replace their entire site with a temporary lead-capture page when they have a limited-time event like this. It eliminates the possibility for instant sales, but creates greater certainty of your website staying up, and arguably even more customer acquisition opportunities as you communicate with them via newsletter. Retargeting or remarketing allows you to track your visitors and then buy ads on Facebook and other sites that target those people. The visitor’s privacy is maintained because they are anonymously tracked, but you have a group of people (could be thousands after a spike in visitors from some media coverage) who are aware of your brand, so the following few months might be an opportune time to turn them into newsletter subscribers, paying customers or even just repeat visitors. I wrote an article about retargeting last year, so I won’t go into all the mechanics of it right now! So how did Blender Boyz fare in the “Den”? They did great! Blender Boyz’ founder, Jim Jackson accepted an on-air deal from Manjit Minhas, who offered $300,000 for a 25% equity stake in the business, plus an ongoing royalty of 50¢ a case . . . But just as importantly, he got some great exposure for the Blender Boyz brand! Do you have any tips for how to make some media attention last? Let’s hear it in the comments below!